It was another last gasp victory for Liverpool on Sunday, but who cares? The three points at this stage of the campaign is all that matters. Hugo Lloris’ weak parry, which ricocheted into the Spurs net off the shins of Toby Alderweireld, secured a 2-1 victory for the Reds in a game which had gone one way and then the other. In truth, we did fully deserve the victory no matter how scrappily it came. It wasn’t vintage Liverpool by any means, but we dominated large parts of the game and other than their goal and when Moussa Sissoko blazed over, Tottenham created very little. The win keeps us very firmly in the title picture, and all we can do is keep on picking up points and wait for Manchester City to crack. Our opening goal on Sunday, which gave us the lead after just 16 minutes, was curiously un-Liverpool. Indeed, it was reminiscent of football of yesteryear as Andy Robertson curled in a sumptuous cross from deep and Roberto Firmino rose to meet it with a header that any striker from the 1980s and 90s would be proud of. We dominated the rest of the first period but couldn’t find a second goal, and after making tactical changes after the break Spurs came more into the game. They equalised through Lucas Moura, and the game appeared to be fizzling out into stalemate before another late, late show from the Reds saved the day. A hopeful ball into the box was met by the bonce of Mo Salah, who headed straight at Lloris. But the French keeper somehow managed to make a complete hash of the save, pushing the ball onto Alderweireld before it subsequently came to rest in the back of the net. The Anfield faithful went into raptures, as they did against Everton and Crystal Palace in similarly last-gasp victories, and regardless of the circumstances its more momentum to take to the south coast for a rare Friday night game this week at Southampton. As you may recall, Virgil van Dijk was hobbling towards the end of the Tottenham game, and there were fears he had done something a tad more serious than his demeanour suggested. It turns out the big Dutchman had turned his ankle, and would subsequently perform his media duties with a large ice pack strapped to the offending article. There is still no clear news as to whether he will be fit to start against his former club, although he was photographed throwing himself around in goal at training on Tuesday and so we assume there is a level of comfort and fitness there! Otherwise, Jurgen Klopp has the normal deck to play with apart from Joe Gomez and Alex Oxlade-Chamberlain, who are both still upping their fitness in training and Under-21s matches. One observation from the Spurs game was that the middle three looked quite leaden, with James Milner and Jordan Henderson both performing the same sort of job. Is there a case for the more athletic and mobile Fabinho to come into the side? 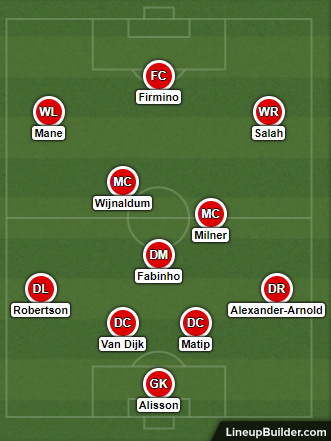 Otherwise, the starting eleven basically picks itself – even with the Champions League clash with Porto to consider next week. The Saints are still flirting with the relegation places in the Premier League, but a string of recent victories has at least opened up a gap between them and Cardiff City. Triumphs over Fulham, Tottenham and Brighton last time out have pumped some metaphorical wind into their tyres, and so from their perspective at least Southampton go into this game with some confidence. And they might need it: the Saints haven’t scored against Liverpool in their last four meetings, with three of those ending in defeat. It’s a theory we’ve offered before, and while the stats don’t suggest as much we still believe that Liverpool are best when playing away from home. That prevents our opponents from sitting in with ten men behind the ball, and the spaces available when playing on the counter attack are where Salah, Mane and co are at their best. We have to give a nod and recognise Southampton’s improved form, but their record against top six sides this term reads W2 D2 L7, and that in itself is instructive. The bookies aren’t making life easy for us by pricing the Reds at around the 4/9 mark, but happily we can beef those odds up a bit by following the numbers. The Saints have only failed to score once in their last ten, and while we are excellent defensively as we know some stats are hard to ignore. So how about this: Liverpool to win and both teams to score can be backed at 9/4, and that looks a tempting price to us. Kop Blog is a site dedicated to LFC and written by a big red who likes a bet or two. We cover previews of all major matches, plus a bit of analysis on the side.